Today is the Ides of March (March 15), which back in 44 BC was definitely not a good day to be Julius Caesar, who was literally stabbed in the back by the Roman Senate during his assassination in the Theatre of Pompey (as depicted above), which was spearheaded by Brutus and Cassius in a failed attempt to restore the Roman Republic, but instead resulted in a series of civil wars that ultimately led to the establishment of the permanent Roman Empire by Caesar’s heir Octavius (aka Caesar Augustus). “Beware the Ides of March” is the famously dramatized warning from William Shakespeare’s play Julius Caesar, which has me pondering whether a data governance program implementation has an Ides of March (albeit a less dramatic one—hopefully). Hybrid Approach (starting Top-Down) is currently leading my unscientific poll about the best way to approach data governance, acknowledging executive sponsorship and a data governance board will be required for the top-down-driven activities of funding, policy making and enforcement, decision rights, and arbitration of conflicting business priorities as well as organizational politics. The definition of data governance policies illustrates the intersection of business, data, and technical knowledge spread throughout the organization, revealing how interconnected and interdependent the organization is. The policies provide a framework for the communication and collaboration of business, data, and technical stakeholders, and establish an enterprise-wide understanding of the roles and responsibilities involved, and the accountability required to support the organization’s daily business activities. The process of defining data governance policies resembles the communication and collaboration of the Roman Republic, but the process of implementing and enforcing data governance policies resembles the command and control of the Roman Empire. During this transition of power, from policy definition to policy implementation and enforcement, lies the greatest challenge for a data governance program. Even though no executive sponsor is the Data Governance Emperor (not even Caesar CEO) and the data governance board is not the Data Governance Senate, a heavy-handed top-down approach to data governance can make policy compliance feel like imperial rule and policy enforcement feel like martial law. Although a series of enterprise civil wars is unlikely to result, the data governance program is likely to fail without the support of a strong and stable bottom-up foundation. The enforcement of data governance policies is often confused with traditional management notions of command and control, but the enduring success of data governance requires an organizational culture that embodies communication and collaboration, which is mostly facilitated by bottom-up-driven activities led by the example of data stewards and other peer-level change agents. “Beware the Data Governance Ides of March” is my dramatized warning about relying too much on the top-down approach to implementing data governance—and especially if your organization has any data stewards named Brutus or Cassius. Once upon a time when asked on Twitter to identify a list of critical topics for data quality practitioners, my pithy (with only 140 characters in a tweet, pithy is as good as it gets) response was, and especially since I prefer emphasizing the need to take action, to propose six critical verbs: Investigate, Communicate, Collaborate, Remediate, Inebriate, and Reiterate. Lest my pith be misunderstood aplenty, this blog post provides more detail, plus links to related posts, about what I meant. Data quality is not exactly a riddle wrapped in a mystery inside an enigma. However, understanding your data is essential to using it effectively and improving its quality. Therefore, the first thing you must do is investigate. So, grab your favorite (preferably highly caffeinated) beverage, get settled into your comfy chair, roll up your sleeves and starting analyzing that data. Data profiling tools can be very helpful with raw data analysis. However, data profiling is elementary, my dear reader. In order for you to make sense of those data elements, you require business context. This means you must also go talk with data’s best friends—its stewards, analysts, and subject matter experts. After you have completed your preliminary investigation, the next thing you must do is communicate your findings, which helps improve everyone’s understanding of how data is being used, verify data’s business relevancy, and prioritize critical issues. Keep in mind that communication is mostly about listening. Also, be prepared to face “data denial” whenever data quality is discussed. This is a natural self-defense mechanism for the people responsible for business processes, technology, and data, which is understandable because nobody likes to be blamed (or feel blamed) for causing or failing to fix data quality problems. No matter how uncomfortable these discussions may be at times, they are essential to evaluating the potential ROI of data quality improvements, defining data quality standards, and most importantly, providing a working definition of success. After you have investigated and communicated, now you must rally the team that will work together to improve the quality of your data. A cross-disciplinary team will be needed because data quality is neither a business nor a technical issue—it is both. Therefore, you will need the collaborative effort of business and technical folks. The business folks usually own the data, or at least the business processes that create it, so they understand its meaning and daily use. The technical folks usually own the hardware and software comprising your data architecture. Both sets of folks must realize they are all “one company folk” that must collaborate in order to be successful. No, you don’t need a folk singer, but you may need an executive sponsor. The need for collaboration might sound rather simple, but as one of my favorite folk singers taught me, sometimes the hardest thing to learn is the least complicated. Resolving data quality issues requires a combination of data cleansing and defect prevention. Data cleansing is reactive and its common (and deserved) criticism is that it essentially treats the symptoms without curing the disease. Defect prevention is proactive and through root cause analysis and process improvements, it essentially is the cure for the quality ills that ail your data. However, a data governance framework is often necessary for defect prevention to be successful. As is patience and understanding since it will require a strategic organizational transformation that doesn’t happen overnight. The unavoidable reality is that data cleansing is used to correct today’s problems while defect prevention is busy building a better tomorrow for your organization. Fundamentally, data quality requires a hybrid discipline that combines data cleansing and defect prevention into an enterprise-wide best practice. I am not necessarily advocating that kind of inebriation. Instead, think Emily Dickinson (i.e., “Inebriate of air am I” – it’s a line from a poem about happiness that, yes, also happens to make a good drinking song). Of course, you will need to be more specific. Declare success using words illustrating the business impact of your achievements, such as mitigated risks, reduced costs, or increased revenues — those three are always guaranteed executive crowd pleasers. Video: Oh, the Data You’ll Show! Like the legend of the phoenix, the end is also a new beginning. Therefore, don’t get too inebriated, since you are not celebrating the end of your efforts. Your data quality journey has only just begun. Your continuous monitoring must continue and your ongoing improvements must remain ongoing. Which is why, despite the tension this reality, and this bad grammatical pun, might cause you, always remember that the tense of all six of these verbs is future continuous. Please let me know what you think, pithy or otherwise, by posting a comment below. And feel free to use more than six verbs. Convincing your organization to invest in a sustained data quality program implemented within a data governance framework can be a very difficult task requiring an advocate with a championship pedigree. But sometimes it seems like no matter how persuasive your sales pitch is, even when your presentation is judged best in show, it appears to fall on deaf ears. Perhaps, data governance (DG) is a D-O-G. In other words, maybe the DG message is similar to a sound only dogs can hear. In the late 19th century, Francis Galton developed a whistle (now more commonly called a dog whistle), which he used to test the range of frequencies that could be heard by various animals. Galton was conducting experiments on human faculties, including the range of human hearing. Although not its intended purpose, today Galton’s whistle is used by dog trainers. By varying the frequency of the whistle, it emits a sound (inaudible to humans) used either to simply get a dog’s attention, or alternatively to inflict pain for the purpose of correcting undesirable behavior. Bad Data, Bad, Bad Data! Many organizations do not become aware of the importance of data governance until poor data quality repeatedly “bites” critical business decisions. Typically following a very nasty bite, executives scream “bad data, bad, bad data!” without stopping to realize the enterprise’s poor data management practices unleashed the perpetually bad data now running amuck within their systems. For these organizations, advocacy of proactive defect prevention was an inaudible sound, and now the executives blow harshly into their data whistle and demand a one-time data cleansing project to correct the current data quality problems. However, even after the project is over, it’s often still a doggone crazy data world. Executing disconnected one-off projects to deal with data issues when they become too big to ignore doesn’t work because it doesn’t identify and correct the root causes of data’s bad behavior. By advocating root cause analysis and business process improvement, data governance can essentially be understood as The Data Whisperer. Data governance defines policies and procedures for aligning data usage with business metrics, establishes data stewardship, prioritizes data quality issues, and facilitates collaboration among all of the business and technical stakeholders. Data governance enables enterprise-wide data quality by combining data cleansing (which will still occasionally be necessary) and defect prevention into a hybrid discipline, which will result in you hearing everyday tales about data so well behaved that even your executives’ tails will be wagging. Without question, data governance is very disruptive to an organization’s status quo. It requires patience, understanding, and dedication because it will require a strategic enterprise-wide transformation that doesn’t happen overnight. However, data governance is also data’s best friend. And in order for your organization to be successful, you have to realize that data is also your best friend. Data governance will help you take good care of your data, which in turn will take good care of your business. Basically, the success of your organization comes down to a very simple question — Are you a DG person? What’s the Over-Under on Communication? The title of my recent blog post Chaos in the Big Data Brickyard made Mike Wheeler think it was a reference to the Indianapolis Motor Speedway, which is known as “The Brickyard” because it was paved entirely with bricks way back in 1909 (today, three feet of the original bricks remain at the start/finish line). This was a reasonable assumption by Wheeler since he is a NASCAR fan (thus making his last name a great example of an aptronym) and thus prompted his blog post Yeah, But Who Won The Race? As usual, I agree with Wheeler (except about being a NASCAR fan — my apologies to Mike and his fellow auto racing fans). In my post Big Data, Sporks, and Decision Frames, I blogged about how having the right decision frame (i.e., understanding the business context of a decision) is essential to whether big data and data science can provide meaningful business insight. Additional context often missing from discussions about big data and data science is that they are not the only bricks in the yard. Data modeling is still important and data quality still matters. As does metadata, data management and business intelligence, data monitoring, communication, collaboration, change management and the many other aspects of data governance. “A successful man,” David Brinkley once said, “is one who can lay a firm foundation with the bricks others have thrown at him.” A successful big data initiative is one that can lay a firm foundation with the bricks of best practices that the data management industry has been rightfully throwing at us for a long time now. Big data does not obviate the need for those best practices — even though it does occasionally require adapting our best practices as well as adopting new practices. 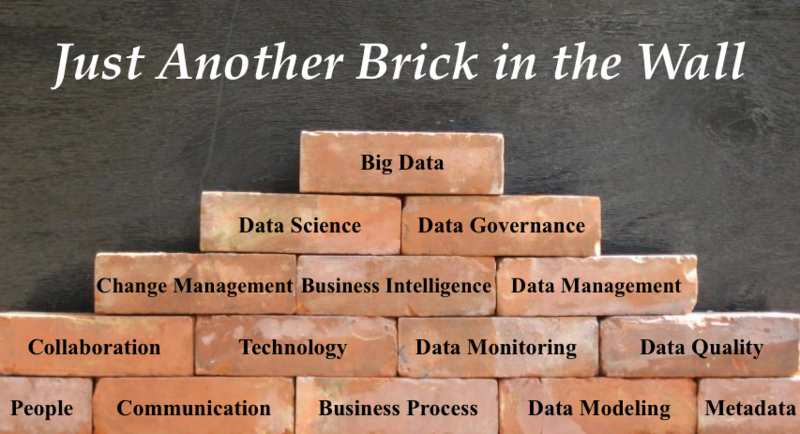 All in all, big data is just another brick in the wall. Defining Big Data — This episode of the Open MIKE Podcast, with assistance from Robert Hillard, discusses how big data refers to big complexity, not big volume, even though complex datasets tend to grow rapidly, thus making them voluminous. Too Big to Ignore — Guest Phil Simon, author of the book Too Big to Ignore: The Business Case for Big Data, offers advice on getting started with big data and remembering that big data is just another means toward solving business problems. 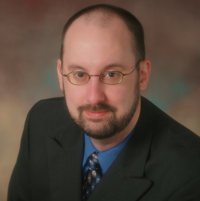 Data Quality and Big Data — Guest Tom Redman (aka the “Data Doc”) discusses Data Quality and Big Data, including if data quality matters less in larger data sets, and if statistical outliers represent business insights or data quality issues. Demystifying Data Science — Guest Melinda Thielbar, a Ph.D. Statistician, discusses what a data scientist does and provides a straightforward explanation of key concepts such as signal-to-noise ratio, uncertainty, experimentation, and correlation. I made a similar point in my post Data Governance and the Adjacent Possible. Change management efforts are resisted when they impose new methods by emphasizing bad business and technical processes, as well as bad data-related employee behaviors, while ignoring unheralded processes and employees whose existing methods are preventing other problems from happening. Demonstrating that some data governance policies reflect existing best practices reduces resistance to change by showing that the search for improvement was not limited to only searching for what is currently going wrong. This is why data governance needs Searchers, not Planners. A Planner thinks a framework provides all the answers; A Searcher knows a data governance framework is like a jigsaw puzzle. A Planner believes outsiders (authorized by executive management) know enough to impose data governance solutions; A Searcher believes only insiders (united by collaboration) have enough knowledge to find the ingredients for data governance solutions, and a true commitment to change always comes from within. Welcome to my roundup of the best blog posts published on the Obsessive-Compulsive Data Quality (OCDQ) blog during 2012. My selections were based on a pseudo-scientific, quasi-statistical combination of page views, comments, and re-tweets, as well as choosing a few of my personal favorites, and which I have organized into four sections of ten best posts by topic or type. Dot Collectors and Dot Connectors — The multifaceted challenges of big data require the dot collectors of data management and the dot connectors of business intelligence to overcome their attention blindness and work together more collaboratively. HoardaBytes and the Big Data Lebowski — Don’t hoard Data, dude. The Data must abide. The Data must abide both the Business, by proving useful to our business activities, and the Individual, by protecting the privacy of our personal activities. Magic Elephants, Data Psychics, and Invisible Gorillas — As technological advancements improve our data analytical tools, we must not lose sight of the fact that tools and data remain only as effective and beneficent as the humans who wield them. Our Increasingly Data-Constructed World — What we now call Big Data is in fact a long-running macro trend underlying the many recent trends and innovations making our world, not just more data-driven, but increasingly data-constructed. Will Big Data be Blinded by Data Science? — With apologies to Thomas Dolby, will the business leaders being told to hire data scientists to derive business value from big data analytics be blind to what data science tries to show them? The Graystone Effects of Big Data — Using a metaphor based on the science fiction television show Caprica, I refer to the positive aspects of Big Data as the Zoe Graystone Effect, and the negative aspects of Big Data as the Daniel Graystone Effect. Exercise Better Data Management — Big Data may be followed by MOData (i.e., MOre Data or Morbidly Obese Data), but that doesn’t necessarily mean we require more data management, instead we just need to exercise better data management. A Tale of Two Datas — Inspired by Malcolm Chisholm and Charles Dickens, there are two types of data (i.e., representation and observation, not big and not-so-big) with different data uses that will require different data management approaches. Data Silence — Not only do we need to adopt a mindset that embraces the principles of data science, but we also have to acknowledge that the biases and preconceptions in our minds could silence the signal and amplify the noise in big data. The Wisdom of Crowds, Friends, and Experts — The future of wisdom will increasingly become an amalgamation of experts, friends, and crowds, with the data and techniques from all three sources often contributing to data-driven decision making. Data Governance Frameworks are like Jigsaw Puzzles — Inspired by Jill Dyché and Scott Berkun, this post explains how the usefulness of data governance frameworks comes from realizing data governance frameworks are like jigsaw puzzles. Data Quality: Quo Vadimus? — With lots of help from Henrik Liliendahl Sørensen, Garry Ure, Bryan Larkin, and many others via the comments, I ponder where data quality is going, and whether data quality is a journey or a destination. Data Quality and Miracle Exceptions — Battling the dark forces of poor data quality doesn’t require any superpowers, and data quality doesn’t have any miracle exceptions, so for the love of high-quality data everywhere, stop trying to sell us one. Data Myopia and Business Relativity — Examines the two most prevalent definitions for data quality, real-world alignment and fitness for the purpose of use, otherwise known as the danger of data myopia and the challenge of business relativity. How Data Cleansing Saves Lives — Although proactive defect prevention is far superior to reactive data cleansing, the history of the Hubble Space Telescope proves that data cleansing can be not just a necessary evil, but also a necessary good. Data Quality and the Bystander Effect — The most common reason data quality issues are neither reported nor corrected is the Bystander Effect making people less likely to interpret bad data as a problem or, at the very least, not their responsibility. Data Quality and Chicken Little Syndrome — A chicken-metaphor-based post about the far-too-common and fowl folly of, instead of trying to sell the business benefits of data quality, emphasizing the negative aspects of not investing in data quality. Data and its Relationships with Quality — The metadata linking the data management industry to what it manages suffers from the one-to-many relationships created by never agreeing on how data, information, and quality should be defined. Cooks, Chefs, and Data Governance — Implementing policies requires cooks who are adept at carrying out a recipe, as well as chefs who are trusted to figure out how to best combine policies with the organizational ingredients available to them. Availability Bias and Data Quality Improvement — The availability heuristic explains why a reactive data cleansing project is easily approved, and availability bias explains why initiating a proactive data quality program is usually resisted. Saving Private Data — Recorded in December 2011, guest Daragh O Brien discusses the data privacy and data protection implications of social media, cloud computing, and big data. Decision Management Systems — Guest James Taylor discusses data-driven decision making and analytical concepts from his book: Decision Management Systems: A Practical Guide to Using Business Rules and Predictive Analytics. Demystifying Master Data Management — Guest John Owens explains the three types of data (Transaction, Domain, Master), the four master data entities (Party, Product, Location, Asset), and the Party-Role Relationship, which is where we find many of the terms commonly used to describe the Party master data entity (e.g., Customer, Supplier, Employee). Social Media for Midsize Businesses — Sponsored by IBM Midsize Business Solutions, guest Paul Gillin, author of four books, the latest, co-authored with Greg Gianforte, is Attack of the Customers, discusses social media marketing concepts. The Evolution of Enterprise Security — Sponsored by the Enterprise CIO Forum, guest Bill Laberis discusses striking a balance between convenience and security, which is necessary in the era of cloud computing and mobile devices. DQ-View: Data Is as Data Does — In this short video, I explain that data’s value comes from data’s usefulness, exemplifying the potential value of unstructured data based on whether or not you put what you read in data management books to use. DQ-View: The Five Stages of Data Quality — In this short video, using my superb acting skills, I demonstrate how coming to terms with the daunting challenge of data quality is somewhat similar to experiencing the Five Stages of Grief. DQ-View: MetaData makes BettahMusic — In this short video, I demonstrate how better metadata makes data better using the metadata automatically and manually created after importing my CD collection into my iTunes library. Metadata, Data Quality, and the Stroop Test — In this colorful (and perhaps too colorful) post, I use the Stroop Test, where colors do not match their names, to discuss the relationship between metadata and data quality. Quality is the Higgs Field of Data — Using one of the biggest science stories of 2012, the potential discovery of the elusive Higgs Boson (which I also attempt to explain), I attempt an analogy for data quality based on the Higgs Field. The Family Circus and Data Quality — Thanks to The Family Circus comic strip created by cartoonist Bil Keane, I explain how Ida Know owns the data, Not Me is accountable for data governance, and Nobody takes responsibility for data quality. Data Love Song Mashup — Since your data needs love too, on Valentine’s Day I wrote this post providing a mashup of love songs for your data (and Rob DuMoulin added a few more in the comments) — Happy Data Quality to you and your data! The Algebra of Collaboration — The trick of algebra equates collaboration with data quality and data governance success when collaboration is viewed not just as a guiding principle, but also as a call to action in your daily practices. The Return of the Dumb Terminal — With help from author Kevin Kelly and my old green machine, I ponder how the mobile-app-portal-to-the-cloud computing model means mobile devices are bringing about the return of the dumb terminal. An Enterprise Carol — Jacob Marley raises the ghosts of a few ideas to consider about how to keep the Enterprise well in the new year via the Ghosts of Enterprise Past (Legacy Applications), Present (IT Consumerization), and Future (Big Data). In 2012, the Obsessive-Compulsive Data Quality (OCDQ) blog published 92 posts, which received 160,000 total page views, while averaging over 400 page views and 200 unique visitors a day. Thank you for reading OCDQ Blog in 2012. Your readership was deeply appreciated. Although much of the early business use of social media was largely focused on broadcasting marketing messages at customers, social media transformed word of mouth into word of data and empowered customers to add their voice to marketing messages, forcing marketing to evolve from monologues to dialogues. But is the business potential of social media limited to marketing? Collaboration was a common theme throughout the panel discussion. Brill said a social business is one that has undergone the cultural transformation required to embrace the fact that it is a good idea to share knowledge. McCabe remarked that the leadership of a social business rewards employees for sharing knowledge, not for hoarding knowledge. She also emphasized the importance of culture before tools since simply giving individuals social tools will not automatically create a collaborative culture. Cameron also noted how the widespread adoption of cloud computing and mobile devices is helping to drive the adoption of social tools for collaboration, and helping to break down a lot of the traditional boundaries to knowledge sharing, especially as more organizations are becoming less bounded by the physical proximity of their employees, partners, and customers. From my perspective, even though marketing might have been how social media got in the front door of many organizations, social media has always been about knowledge sharing and collaboration. And with mobile, cloud, and social technologies so integrated into our personal and professional lives, life and business are both more social and collaborative than ever before. So, even if collaboration isn’t in the genes of your organization, it’s no longer possible to put the collaboration genie back in the bottle. I am often asked about the critical success factors for enterprise initiatives, such as data quality, master data management, and data governance. Although there is no one thing that can guarantee success, if forced to choose one critical success factor to rule them all, I would choose collaboration. But, of course, when I say this everyone rolls their eyes at me (yes, I can see you doing it now through the computer) since it sounds like I’m avoiding the complex concepts underlying enterprise initiatives by choosing collaboration. Although all organizations must define the success of enterprise initiatives in business terms (e.g., mitigated risks, reduced costs, or increased revenue), collaborative organizations understand that the most important factor for enduring business success is the willingness of people all across the enterprise to mutually pledge to each other their communication, cooperation, and trust. These organizations pass what Robert Reich calls the Pronoun Test. When their employees make references to the company, it’s done with the pronoun We and not They. The latter suggests at least some amount of disengagement, and perhaps even alienation, whereas the former suggests the opposite — employees feel like part of something significant and meaningful. An even more basic form of the Pronoun Test is whether or not people can look beyond their too often self-centered motivations and selflessly include themselves in a collaborative effort. “It’s amazing how much can be accomplished if no one cares who gets the credit” is an old quote for which, with an appropriate irony, it is rather difficult to identify the original source. Collaboration requires a simple, but powerful, paradigm shift that I call Turning the M Upside Down — turning Me into We. The Business versus IT—Tear down this wall! Are you Building Bridges or Digging Moats? Last week, when I published my blog post Lightning Strikes the Cloud, I unintentionally demonstrated three important things about data quality. 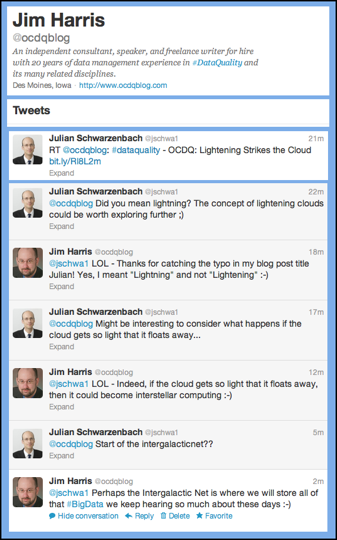 The first thing I demonstrated was even an obsessive-compulsive data quality geek is capable of data defects, since I initially published the post with the title Lightening Strikes the Cloud, which is an excellent example of the difference between validity and accuracy caused by the Cupertino Effect, since although lightening is valid (i.e., a correctly spelled word), it isn’t contextually accurate. The second thing I demonstrated was the value of shining a social light on data quality — the value of using collaborative tools like social media to crowd-source data quality improvements. Thankfully, Julian Schwarzenbach quickly noticed my error on Twitter. “Did you mean lightning? The concept of lightening clouds could be worth exploring further,” Julian humorously tweeted. “Might be interesting to consider what happens if the cloud gets so light that it floats away.” To which I replied that if the cloud gets so light that it floats away, it could become Interstellar Computing or, as Julian suggested, the start of the Intergalactic Net, which I suppose is where we will eventually have to store all of that big data we keep hearing so much about these days. The third thing I demonstrated was the potential dark side of data cleansing, since the only remaining trace of my data defect is a broken URL. This is an example of not providing a well-documented audit trail, which is necessary within an organization to communicate data quality issues and resolutions. Communication and collaboration are essential to finding our way with data quality. And social media can help us by providing more immediate and expanded access to our collective knowledge, experience, and wisdom, and by shining a social light that illuminates the shadows cast upon data quality issues when a perception filter or bystander effect gets the better of our individual attention or undermines our collective best intentions — which, as I recently demonstrated, occasionally happens to all of us. Are you turning Ugly Data into Cute Information? Most organizations have a vertical orientation, which creates a division of labor between functional areas where daily operations are carried out by people who have been trained in a specific type of business activity (e.g., Product Manufacturing, Marketing, Sales, Finance, Customer Service). However, according to the most basic enterprise arithmetic, the sum of all vertical functions is one horizontal organization. For example, in an organization with five vertical functions, 1 + 1 + 1 + 1 + 1 = 1 (and not 5). Other times, it seems like division is the only mathematics the enterprise understands, creating perceived organizational divides based on geography (e.g., the Boston office versus the London office), or hierarchy (e.g., management versus front-line workers), or the Great Rift known as the Business versus IT. However, enterprise-wide initiatives, such as data quality and data governance, require a cross-functional alignment reaching horizontally across the organization’s vertical functions, fostering a culture of collaboration combining a collective ownership with a shared responsibility and an individual accountability, requiring a branch of mathematics I call the Algebra of Collaboration. The point is that everyone, regardless of their primary role or vertical function, must accept a shared responsibility for preventing data quality lapses and for responding appropriately to mitigate the associated business risks when issues occur. Now, of course, as I blogged about in The Stakeholder’s Dilemma, this equation does not always remain perfectly balanced at all times. The realities of the fiscal calendar effect, conflicting interests, and changing business priorities, will mean that the amount of resources (money, time, people) added to the equation by a particular stakeholder, vertical function, or group will vary. But it’s important to remember the true statement that the base equation represents. The trick of algebra is just one of the tricks of the collaboration trade. Organizations that are successful with data quality and data governance view collaboration not just as a guiding principle, but also as a call to action in their daily practices. Is your organization practicing the Algebra of Collaboration? Has Data Become a Four-Letter Word? The attention blindness inherent in the digital age often leads to a debate about multitasking, which many claim impairs our ability to solve complex problems. Therefore, we often hear that we need to adopt monotasking, i.e., we need to eliminate all possible distractions and focus our attention on only one task at a time. However, during the recent Harvard Business Review podcast The Myth of Monotasking, Cathy Davidson, author of the new book Now You See It: How the Brain Science of Attention Will Transform the Way We Live, Work, and Learn, explained how “the moment that you start not paying attention fully to the task at hand, you actually start seeing other things that your attention would have missed.” Although Davidson acknowledges that attention blindness is a serious problem, she explained that there really is no such thing as monotasking. Modern neuroscience research has revealed that the human brain is, in fact, always multitasking. Furthermore, she explained how multitasking can be extremely useful for a new and expansive form of attention. During the podcast, an analogy was made that focusing attention on specific tasks can result in a lot of time spent collecting dots without spending enough time connecting those dots. This point caused me to ponder the division of organizational labor that has historically existed between the dot collection of data management, which focuses on aspects such as data integrity and data quality, and the dot connection of business intelligence, which focuses on aspects such as data analysis and data visualization. I think most data management professionals are dot collectors since it often seems like they spend a lot of their time, money, and attention on collecting (and profiling, modeling, cleansing, transforming, matching, and otherwise managing) data dots. But since data’s value comes from data’s usefulness, merely collecting data dots doesn’t mean anything if you cannot connect those dots into meaningful patterns that enable your organization to take action or otherwise support your business activities. So I think most business intelligence professionals are dot connectors since it often seems like they spend a lot of their time, money, and attention on connecting (and querying, aggregating, reporting, visualizing, and otherwise analyzing) data dots. However, the attention blindness of data management and business intelligence professionals means that they see selectively, often intentionally selecting to not see the same things. But as more of our personal and professional lives become digitized and pixelated, the big picture of the business world is inundated with the multifaceted challenges of big data, where the fast-moving large volumes of varying data are transforming the way we have to view traditional data management and business intelligence. We need to replace our perspective of data management and business intelligence as separate monotasking activities with an expansive form of organizational multitasking where the dot collectors and dot connectors work together more collaboratively. OCDQ Radio - So Long 2011, and Thanks for All the . . . Welcome to my roundup of the best blog posts published on the Obsessive-Compulsive Data Quality (OCDQ) blog during 2011. My selections were based on a pseudo-scientific, quasi-statistical combination of page views, comments, and re-tweets (as well as choosing a few of my personal favorites). Instead of ordering the posts chronologically, I decided to organize them by theme. The Metadata Crisis — There is a running debate within many organizations over the meaning of commonly used terms, which complicates what on the surface seem like straightforward business questions. The Metadata Continuum — There is a continuum, where at one end we have the uniformity of controlled vocabularies, and at the other end we have the flexibility of chaotic folksonomies. However, both flexibility and uniformity provide value. You Say Potato and I Say Tater Tot — The demarcations of the borders between metadata, data, and information are important, but sometimes difficult to discern. In this post, I offer an explanation about these demarcations using potatoes. Data Governance Star Wars: Balancing Bureaucracy and Agility — In character as OCDQ-Wan, I argue in favor of business agility and explain that Collaboration is the Data Governance Force. Data Governance Star Wars on OCDQ Radio — In Part 1, Rob Karel and I discuss our blog mock debate, which is followed by a brief Star Wars themed intermission, and then in Part 2, Gwen Thomas joins us to provide her excellent insights. The Three Most Important Letters in Data Governance — There are only three letters of difference between the words cooperative and competitive, which we could say are the three most important letters in data governance. Aristotle, Data Governance, and Lead Rulers — Well-constructed data governance policies are like lead rulers — flexible rules that empower us with an understanding of the principle of the policy, and how to enforce it in a particular context. The Stakeholder’s Dilemma — There will be times when sacrifices for the long-term greater good will require that stakeholders either contribute more resources during the current phase, or receive fewer benefits from its deliverables. Beware the Data Governance Ides of March — My dramatized warning about relying too much on the top-down approach to implementing data governance — and especially if your organization has any data stewards named Brutus or Cassius. So Long 2011, and Thanks for All the . . . — The OCDQ Radio 2011 Year in Review, featuring Jarrett Goldfedder, who discusses Big Data, Nicola Askham, who discusses Data Governance, and Daragh O Brien, who discusses Data Privacy. The Fall Back Recap Show — A look back at the Best of OCDQ Radio, including discussions about Data, Information, Business-IT Collaboration, Change Management, Big Analytics, Data Governance, and the Data Revolution. Big Data and Big Analytics — Special Guests Jill Dyché and Dan Soceanu discuss big trends in Business Intelligence, including Cloud, Collaboration, and Big Data, the last of which lead to a discussion about Big Analytics. Making EIM Work for Business — Guest John Ladley discusses his book Making EIM Work for Business, exploring what makes information management, not just useful, but valuable to the enterprise. Master Data Management in Practice — Guests Dalton Cervo and Mark Allen discuss their book MDM in Practice, and how to properly prepare for a new MDM program. Good-Enough Data for Fast-Enough Decisions — Guest Julie Hunt discusses Data Quality and Business Intelligence, including the speed versus quality debate of near-real-time decision making, and the future of predictive analytics. Social Media Strategy — Guest Crysta Anderson of IBM Initiate explains social media strategy and content marketing, including three recommended practices: (1) Listen intently, (2) Communicate succinctly, and (3) Have fun. Plato’s Data — Data shapes our perception of the real world, but sometimes we forget that data is only a partial reflection of reality. This theme was also discussed on the OCDQ Radio episode Redefining Data Quality with Peter Perera. There is No Such Thing as a Root Cause — There are no root causes, only strong correlations. And correlations are strengthened by continuous monitoring. This post received excellent comments, including great banter with Martin Doyle. You only get a Return from something you actually Invest in — Invest in doing the hard daily work of continuously improving your data quality and putting into practice your data governance principles, policies, and procedures. The Dichotomy Paradox, Data Quality and Zero Defects — Has your data quality practice become motionless by trying to prove that Zero Defects is more than just theoretically possible? The Data Quality Wager — Inspired by Gordon Hamilton, my rendering of Pascal’s Wager in a data quality context. DQ-View: Talking about Data — DQ-View video discussion about how data professionals should talk about data when invited to participate in business discussions within their organizations. The Speed of Decision — Examines the constraints that time puts on data-driven decision making, pondering whether decision speed is more important than data quality and decision quality. The Data Cold War — Examines how Google and Facebook have performed the Master Data Management Magic Trick and socialized data (“Information wants to be free!”) in order to capitalize data as a true corporate asset. A Farscape Analogy for Data Quality — Ponders whether data is not viewed as an asset because data has so thoroughly pervaded the enterprise that data has become invisible to those who are so dependent upon its quality. No Datum is an Island of Serendip — Our organizations need to create collaborative environments that foster serendipitous connections bringing all of our business units and people together around our shared data assets. In 2011, the Obsessive-Compulsive Data Quality (OCDQ) blog published 112 posts, which received 130,000 total page views, averaging 350 page views and 150 unique visitors a day. Thank you for reading OCDQ Blog in 2011. Your readership was deeply appreciated. Continuing a series of blog posts inspired by the highly recommended book Where Good Ideas Come From by Steven Johnson, in this blog post I want to discuss the important role that serendipity plays in data — and, by extension, business success. Let’s start with a brief etymology lesson. The origin of the word serendipity, which is commonly defined as a “happy accident” or “pleasant surprise” can be traced to the Persian fairy tale The Three Princes of Serendip, whose heroes were always making discoveries of things they were not in quest of either by accident or by sagacity (i.e., the ability to link together apparently innocuous facts to come to a valuable conclusion). Serendip was an old name for the island nation now known as Sri Lanka. These famous words were written by the poet John Donne, the meaning of which is generally regarded to be that human beings do not thrive when isolated from others. Likewise, data does not thrive in isolation. However, many organizations persist on data isolation, on data silos created when separate business units see power in the hoarding of data, not in the sharing of data. But no business unit is an island, entire of itself; every business unit is a piece of the organization, a part of the enterprise. Likewise, no datum is an Island of Serendip. Data thrives through the connections, collisions, and combinations that collectively unleash serendipity. When data is exchanged across organizational boundaries, and shared with the entire enterprise, it enables the interdisciplinary discoveries required for making business success more than just a happy accident or pleasant surprise. Our organizations need to create collaborative environments that foster serendipitous connections bringing all of our business units and people together around our shared data assets. We need to transcend our organizational boundaries, reduce our data silos, and gather our enterprise’s heroes together on the Data Island of Serendip — our United Nation of Business Success. Communication, collaboration, and change management are arguably the three most critical aspects for implementing a new data governance program successfully. Since all three aspects are people-centric, we should pay careful attention to how we are priming people to think and act within the context of data governance principles, policies, and procedures. We could simplify this down to whether we are fostering an environment that primes people for cooperation—or primes people for competition. Since there are only three letters of difference between the words cooperative and competitive, we could say that these are the three most important letters in data governance.